I’m a mutt – a healthy mixture of Irish, Swedish, French, English and something else. But I’m not Mexican. Not even a little bit. At least that’s what my parents tell me. But I think otherwise. Mexican food is in my list of top 2 favorite cuisines, the other being Japanese. I’ve often mentioned my love affair with Mexican food, both the authentic and Americanized versions of it, but have never explained (or pondered) why. So I gave it a little thought. Traditionally, these cuisines are very simple. Authentic Japanese food can be as simple as fresh fish and rice. Authentic Mexican food is as simple as grilled meat, beans and corn tortillas. And every time we visit my girlfriends Mexican side of the family, that’s exactly what we eat: grilled steak, boiled beans and grilled corn tortillas. Sure there are always extras like salsa, guacamole and chips, but I feel the simplicity adds to the appeal. When you minimize the components you open up the natural flavors of the ingredients. I found the same to be true in Spain. I lived there for 4 months and found the cuisine to be quite unique. Spanish cuisine is traditionally very plain: they generally avoid salt and spices in their dishes and you’ll rarely find condiments like ketchup or mustard. At first, it was hard to get used to, but by the end of those 4 months I loved it. I think in many cases, less is more. Refried beans are a passion of mine. I could eat an entire bowl for dinner and be satisfied. 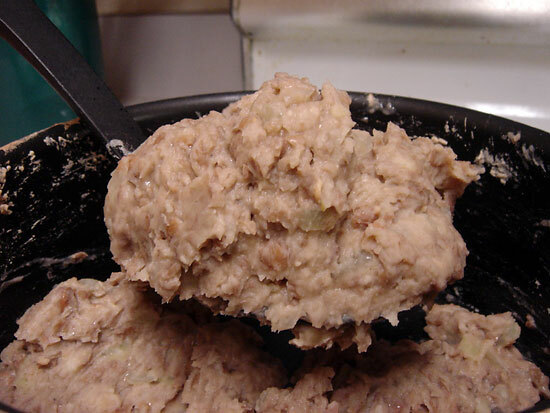 For me, a good bowl of refried beans has a smooth texture with plenty of chunks, not dry but not too liquidy either. It also needs to be perfectly salted. I have tried many brands of canned refried beans. In fact, I keep a list of all the good and bad refried beans from a can, most brands being terrible. But then one day I decided to give up the canned variety and make my own, how hard could it be? Rather than scour the internet for a recipe, I headed over to Elise’s blog and got the inspiration from her Refried Beans. If you’ve never been, you must visit her blog: she produces some killer Mexican dishes. Starting from there, I created a quick and excellent side dish that often ends up being my main dish. If you do make these (and you should), I highly recommend some Homemade Tortilla Chips for dipping, they are the perfect combo. 1. Place the beans in a large pot and cover with about 3 inches of water and a good amount of salt. Bring to a boil, cover and reduce heat to simmer, about 1 1/2 hours. The beans are done when they are very tender and the skins begin to burst open. 2. Heat a skillet on medium-high heat. Add the oil and cook the onions until slightly browned. 3. When the beans are done, drain them and return them to the pot. Using a potato masher or other device (I use the end of a meat mallet), mash the beans to the desired consistency, adding water, as needed, to keep the beans moist. Turn the heat on to medium and add the onions and cheese (if using). Continue to add more water and salt as needed. Serve hot, using Homemade Tortilla Chips to dip. I have a love affair with Mexican food as well. I hate to admit it but I have lived off of guacamole, refried beans, and enchiladas this past week. It’s all I crave and now I want it again! I think I’ll take a jab at your exhibition, it looks fun. Not a fan of refried beans myself but I also lived in Spain for a few months and WOW the food there is amazing. Sometimes it really is the simplest dishes that are the best. Also can your tortilla chips be made with flour tortillas instead of corn tortillas? Did you study in Spain for those 4 months? I spent 4 months in Ireland traveling and eating (and occasionally studying haha). I think the reason why I hate refried beans is because I’ve only had the bad kind. I’m interested to see how you incorporate peanut butter. I had refried beans for dinner and they were quite good, but nothing fancy and homemade, just straight from the cane. That homemade version sure does sound good though, especially with the cheese and chips… I just might have to give that one a go sometime soon! A love for refried beans AND peanut butter is a clear sign of a well-balanced intellect. I am working on the pb breakfast. If I can get my self into the kitchen I’ll whip something up. and yes, homemade refried are the best — they taste better and are almost universally healthier than the pre-made/restaurant fat-ladened versions. I tell ya guys, these are great! My girlfriend said they are as good as her nana’s (grandmother on the Mexican side) refried beans. So simple but you must try them. And hey, they’re gluten-free and vegan (w/o cheese)! vegans eat, To me that’s not a shameful thing but more like bragging rights. Ain’t nothin wrong with that! grace, A lot of Mexican restaurants give you this soupy mess for refried beans. I like some substance to it, which is why these beans are great, because you can control the consistency and texture by adding water and controlling the mashing amount. Refried beans aren’t such a bad thing in the morning! I just polished off an egg, cheese and “soysauge” burrito but I sure wish I had some refried beans to throw in there! sagan, Spanish food rocks. I was studying abroad for 4 months and had the luxury of living with a Senora who did all the cooking/cleaning. We had a home cooked dinner every night, usually consisting of two or more courses. It was some unique but very good food. And yes, you can do the same thing with flour tortillas. They will tend to puff up more, but they will work! cynthia, I love making everything spicy, but I’ve forgotten to make these spicy! I need to try that with my next batch. rosiecat, Haha, it is very strange indeed. I think a good hearty and homemade bean dish is the way to anyone’s heart. Sorta like grandma’s meat and potatoes (for the meat eaters of course). veggiegirl, Perhaps then we all have a bit of Mexican in us! Something about their food is just so basic and simple but incredibly delicious and comforting. celine, Haha, I was trying to come up with a similar but alternate phrase to start off the post…something like legumes, legumes, they’ll make you fume… but then I couldn’t think of how to finish it. Carla, Yes, I was “studying” there. I traveled almost every weekend but never got to Ireland unfortunately. You must know then how impossible it is to find peanut butter in Ireland. I’ve heard it just doesn’t exist! I’ll be getting some PB in those beans soon! Stay tuned! It’s deadly with the homemade chips. lighterportions, The only refried beans from a can that can hold a candle to these ones are a brand called “Kuner’s” and surprisingly “Sunnyside Fat-Free w/ Jalapenos”. Renae du Juor, *bows*, thank you kindly! Now once I incorporate the two together I may in fact be qualified to rule the world. I hope to see your entry!! h.c., One way to alleviate the GI effects is to soak the beans overnight. Apparently this helps quite a bit. I think adding salt while cooking also help. And yep, they’re healthier, cheaper and tastier, especially because you can control the consistency and saltiness! I hope you live somewhere where you can get decent Mexican food. I’m in San Diego, and we’ve got loads of it everywhere you look, but if we go on vacation to say… Florida. Yuck. Don’t order Mexican food in a place where they just know nothing about it! I’ve not attempted refried beans before. Looks like you did a “smashing” job with them! I think if I had to choose one cusine to eat the rest of my life it would be Mexican. Love refried beans. I used to visit my friend who lived out in the sticks and her Mexican neighbor would make us refriend beans with so much lard it clogged the arteries just watching her make it but my goodness how good! I like to pick over a pound or two of beans, let them soak overnight in a BIG container with LOTS of H2O then cook them all day long in a big Crock Pot with a roughly chopped onion, some garlic and either a ham hock or some salt pork. No salt ’til they’re done or else they get tough. Full of folic acid (For the brain) & fiber (for the insides). I have Celiac’s Disease, so this is important to me. My morning breakfast is usually game meat (no fat) mixed with rb, and chopped spinach (Lutien for the eyes), some chopped jalepenos (for the joints) and/or salsa (for the heart). Mexicali Rose dried refried beans are the best. Unfortunately, my Walmart quit stocking them this month. I called their Hq in AR, to no avail. Azteca flour tortillas are also the best flour tortillas…..they are very thin and not tough like most others.